Discussion in 'Effects, Pedals, Strings & Things' started by Whiper11, Apr 28, 2016. Seen this on That Pedal Show a few times and quite like the look of it. Anyone know where to source one from? I've searched a bit but my Brazilian is sub-par. Did you try sending them an email through their website? I was aware of Fire pedals but didn't bother to search any info about them or watch any demos until I saw those guys praising the CD on that same video. Mine arrived yesterday. I just turned it on to see if it was working properly. When I saw the price - with the current exchange rate going on these days, the equivalent to U$110 (free shipping) -, I decided to give it a try. Let me know if you need any help to find a dealer who could ship it to your country (and hurry up before some dealer in the US becomes a Fire retailer and the price goes up - like what happens to TopTone pedals, which current local price equals to ~U$167. Beto, what site did you order your Carpe Diem from? crazy! I was just watching that pedal show not more than an hour ago and wondering about this pedal too. loved the tones they were squeezing out of it and started searching. would love to find a dealer. "I'll try to contact the builder himself in the next few days, as well as some local dealers, to find out if any of them could send it abroad. I'll let you know ASAP as I get some feedback." I had it ordered locally in Brazil. At their local sort-of-eebeey website there are lots of dealers selling them. They are pretty easy to find in music stores overall. It's worth of notice that Richie Kotzen has been using a Fire wah. These guys must be doing something right. Just got one in the mail today. I ordered it through 4garage and they shipped directly to me. Shipping was $28 and took 15 days. Can't wait to get home and see if the hype is worth it. How did you place an order? After lots of emails and messages, Fire put me in touch with http://www.4garage.com.br. Thankfully, I can get along well enough in Portuguese to get them to send one to me. Cost me $200 even shipped to my door. I know they can be had for less but to have it sent directly to me was worth the extra cost. I'm actually playing it right now. ˆNot a bad deal at all. To be fair, because the exchange rate has changed since I ordered one, what I paid for mine in reals (R$) equals to US$127 right now. If this pedal really makes it to become desirable by a reasonably amount of people, be sure that any store in America that turns to become a dealer will probably charge way more than what you paid for yours. How do you like the Carpe Diem? I just ordered one. I emailed them and he sent a PayPal link to purchase one. I went to http://www.4garage.com.br. Thanks for the information! I love it. In classic mode it sounds like my JTM45 and in Hot Rodded mode it sounds like a JCM800. Loves tubescreamers in front and delay after works like an FX loop since its kind of after the 'preamp'. Great pedal. 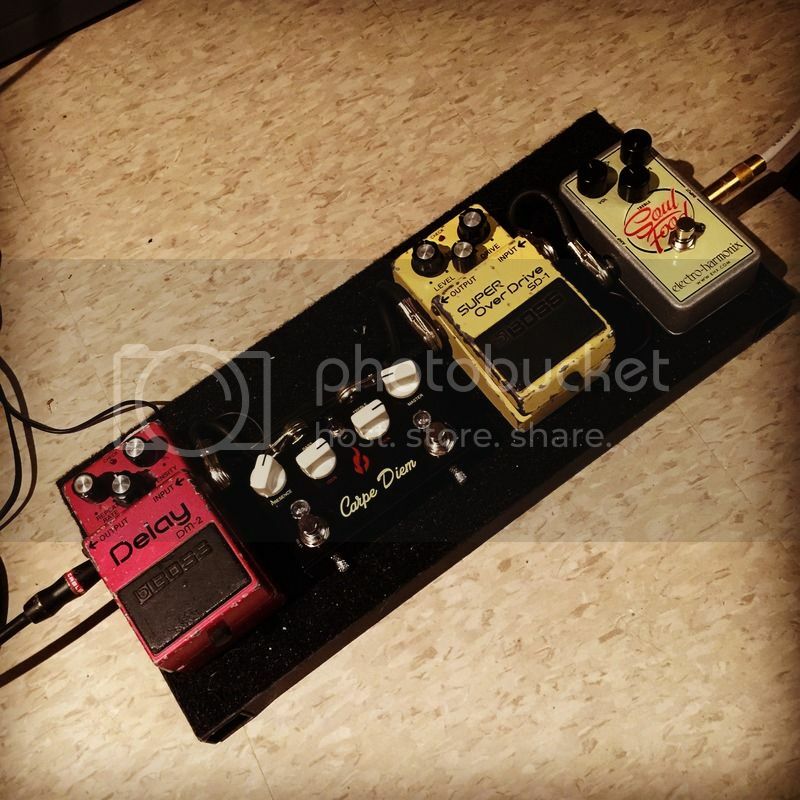 I wish the left footswitch was for selecting between Classic and Hot Rodded modes (although it would need also independent volume controls), instead of solo boost. I wish the footswitch were for selecting between Classic and Hot Rodded modes (although it would need also independent volume controls), instead of solo boost. YES! Could not agree more. I even told my buddy that is needs to be three buttons. 4garage had one posted on eBay for $200 OBO with $45 shipping from Brazil - had to score it! Thanks to That Pedal Show for costing me more $$$! Within a couple of hours I could find some nice spots in both Classic and Hot modes - p.ex. for 'Fly by Night' or 'A Passage to Bangkok' -, playing the Carpe Diem into the clean channel of my Mesa Mark IV. Moreover, this setting sounds great with my TopTone DG-1 into it, as well as gives some extra grit when going into some other OD pedals. Went to place an order and they are sold out. oh well, thanks for the link, though! would really like to hear some clips if anyone has any.